4-Aco-Dmt, otherwise known as 4-Acetoxy-DMT, Psilacetin, or O-Acetylpsilocin is a synthetic tryptamine that is is also considered a prodrug of psilocin. It is the acetylated form of the psilocybin mushroom alkaloid psilocin and is also a lower homolog of the 4-acO-MiPT, 4-acO-DiPT, and 4-acO-DET compounds. 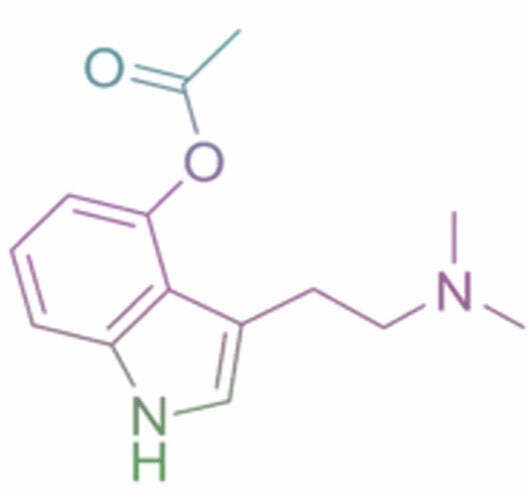 4-acetoxy-N,N-dimethyltryptamine (4-Aco-Dmt) is a synthetic indole alkaloid molecule that is said to get it's psychedelic effects through its function as a 5-HT2a receptor agonist. It is a shared belief by many that 4-aco-dmt may be deacetylated into psilocin as it passes through the liver due to the similar effects it shares with psilocin. Where Can I Buy 4 Aco Dmt? I'm guessing that you can buy 4 aco-dmt here, on Causing Color! Where Can I Buy 4 Aco Dmt With Credit Card? We are one of, if not the only place that accepts credit card. Who is the Best 4 Aco Dmt Vendor? Well, obviously the best 4-aco-dmt supplier is us, Causing Color! What is the Legality of 4 Aco Dmt? The legality of 4 aco dmt depends on where you reside at. For legal reasons, it is generally not recommended to get 4-aco-dmt shipped to Belgium, Brazil, Germany, Italy, Illinois, Nebraska, Nevada, New Mexico, North Dakota, South Dakota, Texas, West Virgina, and Virginia. What is the Best 4 Aco Dmt Price? In order to find the best 4 aco dmt price, first you need to determine who has the highest quality. Higher quality 4 aco dmt ranges anywhere from $140-$250 per gram. Where Did The 4 Aco Dmt Reddit Go!? Due to the recent research chemical subreddit ban, the 4 aco dmt subreddits are no more than a distant memory for the most part. Because of this, it'd be wise to eventually find a new home. is one that comes to mind. Is the 4 Aco Dmt Erowid a Great Resource? Very! You can read people's experiences with the compound, find scientific literature on it, and even find dosage information. What is the Recommended 4 Aco Dmt Dosage? What Should I Do About 4 Aco Dmt Tolerance? Tolerance to 4 aco dmt is shown to go up immediately after inital exposure. It generally takes about 2 weeks to a month for tolerance to completely reset. What is 4 Aco Dmt Microdosing? 4 aco dmt microdosing is where a user takes a sub-active dose of the compound in order increase mental and physical performance. According to 3rd party sources, 4 aco dmt has more geometrical patterns akin to DMT than magic mushrooms. Magic mushrooms and 4-aco-dmt have similar physical effects in the sense that they both producing yawning, watery eyes, runny nose, pupil dilation, and more. They also have very similar mental effects due to molecular similarities and courses of action. 4 aco dmt is also easier to dose than magic mushrooms due to the varying doses and compounds often found in mushrooms. Above all, 4 aco dmt is a research chemical not recommended for human consumption where as mushrooms has years of human testing under it's belt with a proven toxicological profile. 4 aco dmt generally lasts for about 6 hours where as smoked DMT only lasts for a few minutes. Almost every other aspect of the two compounds are very similar in effects. Above all, 4 aco dmt is a research chemical not recommended for human consumption where as DMT has years of human testing under it's belt with a proven toxicological profile. The experience of 4 aco dmt is similar to others in the tryptamine class with minor differences in visuals. Generally speaking, 4 aco dmt is considered a deeper experience than other acetylated tryptamines. At first the user may experience minor visual disturbances in their field of view. A short time after that, users generally find themselves in a hyper state of awareness where nearly all mental facilities are severely enhanced. In other words, logic and reasoning abilities are increased, emotional connections are amplified, and the ability to project 3 dimensional objects with the imagination becomes a normal experience. Going further, the 4-aco-dmt experience enables one to process much more quicker on the spiritual level due to it's ego softening and concentration inducing abilities. Through the extreme quieting of the normally active mind that's identified with the sense objects it projects, a user can transcend ordinary consciousness permanently and achieve a higher state of consciousness. This higher state of awareness where the user no longer identifies with their ego can become permanent. Beyond that, if you dive further into the 4-aco-dmt experience, you'll find that you'll lose complete awareness on the sensory phenomenon that shape your perception of reality. During this comatose like state one will often find themselves as nothing. However, it should be noted that when we say 'nothing', what we really mean is 'no thing'. In other words, when one is completely disidentified with sensory phenomenon, they will find that they still exist as this foundational layer required for the existence of anything. This foundational layer is often referred to as 'Pure Consciousness' or 'The Void'. What Are The Effects of 4 Aco Dmt? The physical effects of 4-aco-dmt are sedation, tactile enhancement, nausea, muscle contractions, muscle relaxation, excessive yawning, watery eyes, frequent urination, pupil dilation, runny nose, teeth grinding, and more. The cognitive effects of 4-aco-dmt are analysis enhancement, novelty enhancement, immersion enhancement, creativity enhancement, conceptual thinking, emotion enhancement, empathy enhancement, language suppression, increased sense of humor, cognitive euphoria, ego death, feelings of impending doom, thought loops, time distortion, delusion, mindfullness, and more. The visual effects of 4-aco-dmt are visual acuity enhancement, colour enhancement, pattern recognition enhancement, drifting, colour shifting, colour tinting, visual haze, diffraction, tracers, after images, symmetrical texture reptition, perspective distortions, depth perception disortions, scenery slicing, and more. "As a reflection of the deeply transformative relationship I have had with the psychedelic experience, this trip report aims for a transparency of intention that affords a healthy separation from my own bias. In pursuit of this ideal, exhaustive note taking occurred both during & after the experience; corroborated & further detailed by my partner in crime the two days following the trip, I am confident this report reflects the novel psychedelic objectivity afforded to me by the unfamiliarity of the RC tryptamine family to my system. Although my experience with this class of compounds is relatively limited, I am no stranger to the psychedelic experience; I am a seasoned warrior & advocate of the phenethylamine, ergotamine, & dissociative classes of psychedelic drugs. Quick administrative stuff: from here on out I will refer to my accomplice as “Kai”; dosages were pre-weighed to .024 grams with a +-.001mg scale & dissolved in solution prior to consumption. Tolerance is a non-issue. With that in mind, let us begin with Act one: the illness. +0:00 With my eyes closed, I took a few deep breaths in preparation for the experience to come. With our concoctions raised, Kai & I silently acknowledged the infinite possibilities that existed before us; as the bitter taste began to fade, so shifted my pre trip anxiety. No longer burdened by the possibility of turning back, my relationship with this new fate became the object of my mind's focus. +0:05 Homeostasis is no longer in effect; as I took stock of 4-AcO-DMTs oral efficacy, my visual modality began to change. While taking note of this hyper-attunement to such optic phenomena, the sense of self so deeply attached to my sober state began to lower its guard. +0:35:00 I feel energy pulsating through my veins & my cheeks are flush. As I focus my eyes on the couch I remark to myself how incredibly deep the brown color is. The rest of the room also appears crisp & sharp. +0:45:00 Increasing waves of nausea felt directly in my stomach lead me to the bathroom to purge. +0:50:00 Vomiting is not unpleasant but occurs multiple times, not the “one & done” purge I have experienced in the past. While in the bathroom I spend time contemplating my use of psychoactive substances. I question whether I still have more to gain from them or perhaps I have seen what was to be seen & should now break from them. As I exit the bathroom I glance in the mirror and see that I my face is ghastly pale, with blushed cheeks paired with bloodshot & watery eyes. Kai notices my terrible appearance & comments that it sounded as if I “was dying” in the bathroom. I assured her I felt far better than I appeared. While on the topic of appearances I take a moment to simply appreciate Kai’s beauty. Kai’s almond shaped eyes, tan skin tone & brown dreadlocks made her appear to me as an island beauty in my minds eye. I feel as though verbalizing this was not necessary. It is already apparent to us both in our locked gaze; I can tangibly see her love for me in her eyes. +01:00:00 I need to visit the bathroom again & Kai decides to escape the sounds of vomiting by lying outside in the backyard. Our lawn area is a few acres of severely imperfect grass met at its border by a tangle of apple trees. Kai montage of miscellaneous trees & greenery that is a New Hampshire forest border the entire property. The first hour has passed incredibly quickly. I am pleased that I have not experienced a psychedelic time stretch while I am being sick. My open-eyed visuals have increased immensely by now. The white silk curtains in the bathroom have dazzling patterns moving at a moderate pace across them. Geometric formations of both rigid & fluid shapes are swirling across the white fabric. I later noted that the curtains had no pattern at all &instead featured small squares approximately half a centimeter squared in size. The color of the walls is saturated to the fullest; a brilliant almost wet bright blue color instead of their normal flat blue-grey tone. After 1 – 2 seconds of allowing my eyes to settle on an “object” such as a wall or floor, I was seeing the object “breathe”. The breathing is a repeating series of contractions & expansions. As an example, the tiles on the floor are squishing together so that there sides are bent lines. The sides of each square never touched but flex inwards until the shape is about 50% of its normal width. +01:20:00 I make my way outside to join Kai. I am delighted to locate her lying in a supine position having a conversation with the large Oak Tree she is beneath. Kai eases my worries of her having any sort of negative experience, assuring me that she is having a lovely time & that her stomach feels perfectly fine. +01:45:00 A new wave of nausea hits me & I return indoors to vomit once more. By the time I am inside I no longer feel the nausea. I drink a glass of water hoping that this time it will finally stay down. I remembered that Kai had mentioned possibly being interested in smoking some cannabis before I had come inside. I collect the necessary items to roll a joint & sit to roll. I mangle a pack of rolling papers attempting to remove a paper & quickly realize that I did not possess the motor skills necessary to complete the job. I pack up the supplies & head back to Kai on the lawn. My swaying uneven stride alerts me to further motor skill impairment. I giggle & find it interesting & entertaining how clumsy I have become. Conversely my mind remains clear with the innate ability to focus on tasks at hand as well as muse abstract thoughts. As I join Kai once again I come to the positive realization that I have reached a plateau in the experience. I only know this has occurred because of a feeling / understanding that my mind has reached the destination of expanded size. My mental space is no longer expanding. It has settled along with my stomach, & I feel incredibly comfortable with my state of being, both mental & physical. The departure from baseline was swift & rough for me, but smooth & gentle for Kai. I attribute this to my anxiety about diving back into the psychedelic realm once again. I present Kai with the grinder full of marijuana & the mess of papers. She is able to command her hands well enough to place the greenery inside a paper but this is as far as she can manage. +02:00:00 The temperature has reached 83º F with little cloud coverage. When outside the protective shade of the Oak Tree I can feel myself baking from the suns rays. I suggest to Kai that we use the hose to cool off. As soon as I turn on the hose I realize how monumental this idea was. My mind is processing each water droplet flying through the air until it connects with the grass below. As I study the droplets I see each has a clear outside coating. (Such as the shell exists on a pistachio nut) Inside this layer is a streak of dazzling white surrounded by faint polychromatic lines. The lines look similar to the colors that one may see in a puddle of gasoline on the asphalt. I am blown away at the super-power processing that my eyes & brain are performing. Shaking the hose in different directions while varying the nozzle setting (to allow different types of water streams such as a fine mist, strong single jet or any variance in between) results in a cheesed out smile that just won’t quit. My entire mind, body & soul is enraptured in pure bliss. Nothing could have make me happier than being in the here & now that I was in. +03:00:00 Kai & I have been alternating control of the hose for the past hour. During this period of time I note to myself how perfectly level the effects of the substance have been. The experience is smooth in every sense & I am maintaining a finely tuned mental clarity. All of my senses remain heightened. The sun-warmed towel after the ice-cold water sent goose bumps racing all over my body. This hour with the hose seems to last for an incredible amount of time. +03:15:00 Kai & I decide to sit on the deck as it offers shade as well as close proximity to music & water. We go to collect the beginnings of the joint we had abandoned underneath the Oak Tree. Upon looking at the filled paper & rolled crutch, I suddenly gain confidence. I sit back on my haunches &spun up a decently clean looking joint (containing .75 g + - .05 g) in a matter of seconds. On the walk back up to the deck I attempt to describe to Kai what it had felt like to “realize” that I could roll us a joint. The realization was mental, but translated directly into physical improvement of my motor skills. The saying of “mind over matter” was in this case most fitting. I do not believe I was tripping with any less intensity than during my first attempt. The only difference is the change in my mental state. During the first attempt my mind had preoccupied trying to get a hold of the experience that was unfolding upon me. The second attempt at rolling found my mind in a relaxed & confident thought-stream. We share the joint while discussing what music to listen to. I find myself talking with more gusto than normal. I am thinking at an accelerated pace but having difficulty verbalizing the thoughts. The pattern of conversation was also off kilter. Before finishing one conversation, I found myself drifting to other related topics. Idea “x” led to idea “y” & while trying out different wordings to explain “x” I would begin to simply move on to “y”, “z”, etc. For both Kai & I smoking immediately enhances the effects of the 4-AcO–DMT. My vision brightens with each inhalation & I feel my headspace expanding once again. Kai nobly states, “From now on I will listen to music, not songs”. She continues to explain this statement by expressing her desire to stop listening to the same specific song[s] thousands of times. Instead she will explore more, constantly enjoying new audio material with the goal of maximizing the joy which comes from the simplicity & complexity of rhythm, sound, beat & bass that is music. I was suddenly enlightened. Listening to new music more often would be refreshing. The idea also offered insight into how one of my friends always seems to have the best music when I visit him. He is accessing more music because he is not listening to tracks on repeat. When friends visit he shares favorites. He is listening to music, not songs. * I included this previous passage regarding music not because the content itself is pertinent to all readers but rather to provide an example of the mental clarity that was possible during this part of my experience. The thoughts & revelations of our conversation are forming themselves and being shared with complete ease. +03:30:00 Acting on this new idea, I put on an online radio application that allows me to hear random songs my friends have favorited, relieving me of the duty of selecting songs. I was happy to find that using the computer was easy & I navigated with precision & speed. Kai & I stay on the deck as we listen as the sweet sounds of deep house. Every song we heard sounds amazing even as the genre shifts dramatically. The speakers we use are of mediocre quality but to me it sounded as though the DJ’s, bands or artists were performing live before me. Conversation flows in & out of existence. When a thought is finished, neither Kai nor I add unnecessary filler. I fill the silence with slow paced peaceful thoughts. Other times I leave my mind blank and thoughtless to survey everything around me. A level of tranquility is reached in my mind, complemented by a sedating and pleasurable body high. My mind has embraced the 4-AcO-DMT. The synchronicity of thought and communication is unparallel; overwhelming, in fact. Unlike the pushy phenomenological experience I am familiar with under the influence of stimulants (amphetamine family and co), the totality of the substance carries with it a smooth cleanliness I had never before experienced. It seems to have provided me with an intellectual/conversational prowess bar none. Specifically, I am most intrigued by the concise, descriptive manner in which I am able to articulate myself. Although I have no explicit evidence to support this next claim, my experience elicited the thought that my newfound capacity to share my thoughts was made possible by an ability for selfless, patient listening of Kai. Balance is everywhere I look; our conversation is in its right place. I feel proud of what we have said, how we have said it, where & why we have said it. +04:00:00 My perception of time has sped up, no longer passing in slow motion. It seems to me that the shot glasses & nausea were days in the past. I am feeling more energetic now. I begin to dance feeling fluid & creative. Each movement fits perfectly in sync with the music & I am quiet confidant. +04:30:00 Dancing & conversation have continued. I feel the plateau reach completion & my return to baseline begin. I am still feeling the effects of the substance but not as heavily as I have for the past several hours. Curiosity creeps into my mind as I wonder how the return to baseline will feel. I know that my expanded headspace will be diminishing but am unsure how noticeable it will be. I question whether my motor skills will return from their weakened state at the same pace as the diminishing mental effects. Kai & I debate taking a booster dosage. We have dedicated the day to exploration & it is still early. On the other hand I am unsure of how a booster will interact with our earlier dose. I have no desire to go too far & ruin what has already been a beautiful experience. We weigh our options quickly & decide to take a booster weighed to maintain our current level of experience. If the booster did nothing, so be it; better to be under-whelmed than overwhelmed. I cut two lines of the same 4-AcO-DMT we had ingested earlier. Each line weighed out to .012g + - .001g. +04:45:00 I insufflate my booster after clearing my nose. The burn is non-existent for the first sixty seconds after snorting A very slight sting develops at the upper reaches of my nostril. I was expecting severe pain & am pleasantly surprised when the pain does not increase. Almost immediately after insufflating I feel a new push of the substance in my system. I look to Kai & comment, “I just put my HD-D-D glasses on”. Within seconds of insufflations everything in my visual field becomes crisp while at the same time my depth perception begins to dissolve. Upon hearing my remarks of how painless the booster was, Kai sits herself at the counter where I have prepared her dose. As Kai prepares for her booster my gaze is shifting between the refrigerator & the couch. I know from familiarity with the layout that I am equidistant from both. My current depth perception is begging to differ as I experience severe special relationship deficit. The couch to my left appears within arms reach while the refrigerator on my right appears two or three times this distance. I feel lovely, farther from baseline than the plateau but I believe these stronger effects will be short lived. I am surprised to look at Kai & see her still contemplating her booster. I immediately feel as though I have pushed her to do something she is not completely comfortable with. When I express this concern to her Kai responds to me that she has been unable to “make sense” of the task at hand. The line of powder was angled away from her & she was unable to connect in her mind that she either needed to move herself or readjust the powder. Coming out of this trance Kai quickly cut her line and insufflated her booster. +05:15:00 Kai & I make our way outside after rolling a second joint (containing 1.2g of marijuana + - .1g). My hands are shaky but not as impaired as they had been earlier. I light this joint as we head towards the back edge of the lawn closest to the forest. We finish smoking rapidly & examine the various trees & foliage confronting us. Kai asks me about the landscape we are looking at. I should know the answers to her questions as I have worked in & explored these woods on numerous occasions. I cannot tell which trees are closer to me than others nor can I estimate how far I am seeing. My horizon line could have been forty feet away or it could have been two hundred yards. I would have believed either as my figure ground impairment increases dramatically. +05:30:00 I begin to let my eyes relax now, no longer consciously focusing on any one object or area. Open-eyed visuals provide me with a spectacular show. I am looking into the forest & process angles that exist but not normally noticed. My ability to focus my eyes has left me. I feel as though my eyes are focusing on two points at once. This creates new dimensions from the fact that I am focusing on points in space that humans normally look through. My vision is focusing on specific locations in the air, creating fantastic geometric planes of energy. The planes intersect and interact with one another as they snap from one spatial existence to another as I refocus my eyes. Objects move in the furthest reaches of the forest that I can see. Trees & leaves lose their shape & my mind redefines them. I do not see leaves; I see green shapes that begin to morph into small people whom are walking around. The tiny people are walking on tan pathways that defy the rules of physics similar to a Penrose Staircase. I check in with Kai who notes that she is happily experiencing a similar visual level to mine. I returned my eyes to the woods at the edge of the lawn. This time the depth of the forest is filled with tan bricks that form a beautiful castle. On this castle are pathways that look similar to the styling of the Great Wall of China connecting the turrets of the castle. Along these pathways are small green people, similar in shape & size to those I saw before. The castle remains even when I move my eyes left & right examining in vast detail different parts of the castle & its inhabitants. I can see these small beings, but they do not have any “entity” qualities or personality to them. They are exist visually but not past that. +05:35:00 The castle has disappeared & I am left looking into a mesh of greenery that is in constant motion; swirling, morphing, folding & unfolding. After a few seconds the castle re-appears. It is exactly the same in structure but the colors are different. I believe this is because my center of vision has changed and thus different colors are now responsible for different parts of the castle. The castle disappears & re-emerges again several times, usually at an interval of five to ten seconds. I realize the booster has put me at a much higher level than any other time today. I have long overshot my dosage goal of continuing my experience level. I become enveloped in my thoughts as I adjust to this new level of intensity. A few worries slam to the forefront of my mind: Did I make a mistake when weighing the doses? Is Kai okay? Was I okay? All of these questions were answered for me by Kai’s smile. I look up at the grand Oak tree & see five distinct colors. A deep forest green, bright pumpkin orange, light fern green, cardinal red & red-violet all take up equal sections of the tree. There is a handful of faces formed in the leaves. Differing colors, shadows & the space between the leaves are what give the faces their shape. The faces are all identical & very simple cartoon-like in nature not humanoid or realistic in any way. I shift my eyes to a different part of the tree & instantly see fifty or more faces scattered across the Oak’s leaves. Each eye movement produced a new group of faces. At one point hundreds, possibly thousands of faces, populated the tree. I am focusing 100% of my mind on the Oak tree & neither Kai nor I speak a word. I glance quickly at the house & take no interest. Left of the house is four tall Pine trees. The trees are so close together that their distinctly colored blue & green needles mesh into one another on branches that are distinct & defined. Each branch was waving in a peaceful & manner. The movements are not minor in their action however, The tree limbs are like giant arms made of spaghetti, slowly writhing amongst one another. I perceive a clear personality for each of the trees. Kai & I break our silence by verbally agreeing that all four Pine Trees are male in their personas. The strength of the mental effects is equal to that of the visual ones. Life is now surreal. I have lost connection to “sober me” completely; thoughts of tomorrow’s plans are light-years away. I sensate that I am connected with space & time, a clear bond exists between the universe & myself. Thinking of the idea of time leads me to the thought that time is best described as an infinitely smooth entity, ebbing & flowing. Measurements of time such as days, hours & minutes chop up this beautiful entity into synthetic divisions. Today, in this moment, these divisions have dissolved. +06:00:00 I am on the edge of the experience being too strong. I decide to preoccupy myself, with hopes of herding my wandering mind from reaching a negative space. I Remembering how much fun I had with the water earlier I sprinted to the hose anticipating an uplifting time. The cold water is excruciatingly wonderful on my skin, similar to when fingernails tickle your back. Mist provides Kai’s dreadlocks with a glistening silver coating of miniscule dewdrops. We both laugh heavily at the sensation of being wet until my stomach aches from pleasure. All thoughts of being overwhelmed by the booster disappear as Kai & I chase each other with the hose. During our playing I contemplate the peculiarity that even after hours of using the same hose, the jet of water makes me flinch. I test my reaction & find that the fastest setting with the hose aimed right at me does not hurt in the least. Contrarily I find the sensation of cold water at high-pressure quiet enjoyable in the summer sun. I maximize the amazing sensation by aiming the water at a medium pressure straight up. I lean my face 90º forward so my eyes, nose & mouth are perpendicular to the water stream. The water maxes out my senses. I hear the water rushing past my ears as loud as Niagara Falls. I taste the water as it infiltrates my clenched teach which have loosened into a wide smile. The physical sensation of ice-cold water abruptly enveloping my face was exhilarating & literally took the breath from my chest. Closed-eyed visuals erupt as the water hits my eyelids. A golden-red sun fills my vision. Circles of descending diameter stream continuously from the central point & spin outwards into incomprehensively complex patterns. I shake my head dry & inspect Kai’s blank facial expression. The joy has disappeared but has not been replaced by fear. When I looked up to see Kai with this very “blank face” I quickly asked her how she was feeling. Knowing how close I had been to the edge of “too far” I fear she might have passed a comfort level. She responds that she is doing splendid & I felt a wave of relief. My stomach relaxed & I felt as though I had just let out a deep breath after holding it for a long period of time. The physical effects of worrying had never been so clear to me. The blank stare turned out to be nothing more than Kai “spacing out” and enjoying some visuals on the ground behind me. My momentary worries are behind me and Kai is no longer enraptured by the patterns swirling through the grass behind me. We return our attention to the hose to examine the mist droplets that are rearranging themselves in midair. I watch parallel lines & geometric oddities come to life within the millions of petite droplets. The droplets are suspended in the air, never seeming to fall. The geometric shapes become three-dimensional as dazzling tunnels & holes appear through the water. The visuals are delicate in nature but prominent in strength and intensity. + 06:30:00 Clouds cover the sun & resulting in a sudden drop in temperature. Kai & I decide the time has come to dry off & change into comfortable clothes. As we embark on the short walk back to the house Kai I stops me abruptly to point out a small butterfly. She exclaims, “Look at the patterns & colors! How beautiful!” I scan the grass around us & upon seeing nothing, ask her to point out the butterfly. I am in utter disbelief when she shows me the tiny butterfly about fifteen yards away from us. I wonder how she can see with precision at such a far distance. I think to myself “surely she cannot see the spirals of colors on those wings! They are beating much to quickly!” The split second this thought enters my mind I realize that I too am seeing the same details Kai is describing. I take note again of the “super-power” effect that this tryptamine is having on my modality on all levels. Upon entering the house I immediately realize how deep I have ventured into the psychedelic realm. A weight slams onto my mind. I am overwhelmed by the closeness of the walls & roof. Nearly everything in my field of sight is expanding & contracting vigorously. As I use the bathroom I realize that even simple tasks are proving difficult. I leave the bathroom for Kai to use while I search for clothes in my own room. I begin the process of finding clean boxers, athletic shorts & a Tee Shirt. For several minutes I pick up random items of clothing, unzip backpacks, zip them shut again, open drawers looking inside only to shut them directly after. Stress is building along with the familiar creeping sensation of “going too far”. I strongly desire to locate clothes & get back outside as fast as possible. I realize I have been naked since the bathroom. I had completely forgotten my realization from only minutes before: simple tasks were going to be difficult & thus I should not debate decisions but simply make a choice & be done. I rapidly select a comfortable outfit at random then exit the room. The completion of the clothing task calms me slightly. I sit to wait for Kai to finish changing & using the bathroom. The extensive visual breathing of objects is not frightening but renders me incapable of intensive mental or physical operation. The alterations of my visual field continue to intensify. The hallway to my left becomes what I can only describe as a “gravity center”. At the bottom center of the doorway, a point exists which is stretching objects, pulling them towards it. The doorframe shrinks thinner as the pulling of objects accelerates. The floorboards rush down the hallway. Next to go is the corner of the couch along with the side of a white bookcase. I look away then return my gaze to the hallway. The couch & bookcase have reset to their original locations but a heartbeat later they have again begun stretching towards the bottom of the doorway. I retry looking away with the same result. I am concerned that Kai may be inundated with effects & I leave my seat to offer her assistance. I find Kai struggling to select clothes just as I had. As a team we are able to find all necessary items in about a minute before making our way outdoors. At the door I paused, struck by the curtains. Tiny holes in the lace form magnificent flower patterns. Flowers bloom, swirl & dance with harmonious beauty across the wind blown drapes. I exit the house & immediately feel a weight leave me & I can feel my mind relax slightly but not completely. I am caught up in the pleasant thought of overcoming the difficulties brought on by being inside. This is abruptly interrupted when I am startled by a face who is staring up at me when I glance down at my feet. Despite being but four inches square in size, a strong male presence radiates from this being. His eyes dance like fire piercing as if challenging & judging me simultaneously. I looked up, never returning my gaze to that spot to see if the face would be there again. +07:00:00 Kai & I return to her Oak Tree spot & lay down on our backs beneath the tree. I stare upwards into the branches & leaves of the giant tree & experience oddly few visuals. I am thankful for this plainness after the intensity of being in the house. Closing my eyes is rewards me with very slow paced flower patterns. The images fade in & out of one another peacefully. I watch a Lily Flower with long orange petals change shape by expanding from the center of my “vision”, (my eyes are closed), until the flower fills my eyelids from side to side. After filling my vision the flower’s petals doubled back & overlapped the original flower. Before long I was looking at a dozen or so Lily Flowers dancing against an orange background. The simplicity of these visions struck me oddly. There was none of the unimaginable complexity my CEVs as I often experience with other substances. I feel as though the 4-AcO-DMT is nurturing me, motherly in its nature to help calm my mind. All my other senses seem to have faded while I was concentrating on my head movies. I had not felt any discomfort from lying on the ground, where my body ended & the Earth began was not easy to discern. I sit up to take a look around the yard. A large Rosemary Bush across the lawn is waving its tentacle-like branches at me. Every tree was alive with motion & emotion. All vegetation is consciously controlling their bodies seemingly in acute accordance to their unique personalities. I lie back down & speak to Kai about her experience since the booster. I gather that she is fully enjoying the effects but does not wish to go any further. Looking back this is the part of the day which is the most difficult to remember. The few short conversations with Kai are jumbled up with my internal thoughts & conversations I had with myself during the same time period. I sit up approximately every five minutes to reassess the surroundings & look at Kai who is remaining perfectly still. I am thoroughly enjoying the mental space I am in while laying down but the visual stimulation presented to me each time I sit up takes away from my mental effects. +07:30:00 I sit up just as I have each time prior. The instant I am fully sitting up I know with incredible confidence that I am on the exact level I had enjoyed so much, prior to the booster. My mind is exponentially easier to navigate than it has been for the last hour & a half. The Rosemary Bush has settled & everything about the experience is much more under control. The rapidness of the change is remarkable. I feel as though I have been in my own remote mental space since we entered the house to change. I am excited to be back in a mental place which will allow me to connect more easily with Kai. I tell her how suddenly I am “back down” & she agrees that she is near the level we were previously at. +08:00:00 The effects begin to dwindle. Unsure if I am returning to baseline or if I am a bit tired from the re-dose, I continue exploring my mind. +08:50:00 We have returned to baseline. Some CEVs remain, but the intensity has diminished nearly entirely. Although some trails in my visual space remain, my OEVs have dissipated as well. The trip has reached is conclusion. We relocate to the deck to enjoy the last few hours of sunlight. With some chill beats in the background, Kai and I discuss the day's events as a platform for a broader conversation: in what instances are psychedelic substances useful and appropriate in the human experience? In our minds there is no question of their usefulness as therapeutic/transformative tools. We agree that for us personally, maximum growth will only be achieved if sessions with these tools are well planned and not severely common. Conclusion/Notes: Start to finish the experience lasted 9 hours, with a slight (but pleasant) afterglow running into the next day. In my experience, the acetylated form of 4-HO-DMT (psilocin) was both gentle and feminine in its cocoon of psychedelia and highly intense in its distinct boost to my self-confidence which subsequently enhanced my intellectuality. While the duration of the experience was only marginally extended [1.5-2hrs] by the second dosing, the visual and overall intensity was raised from ++ to +++. Insufflations should be approached with caution--it hits just as hard as it does quickly. First-timers and particularly sensitive individuals should limit/abstain from marijuana use (although it can be a valuable tool for unique exploration for many). Well-calibrated and highly accurate measuring devices are a necessity with this substance. Water measurement advised for those without milligram scales. Be careful of degradation with the freebase form of this substance; cool and dry area with airtight/light-tight container recommended. Before you leave this page and move on with your life, know that the thoughts and musings I have shared with you are neither fact nor fiction; they are my opinion, and mine alone. You are entitled to adopt and share these ideations, but beware of subscribing to ideologies that were not deduced via [your own] experience, for those are merely empty beliefs founded on information. They could be correct, but they are right for all the wrong reasons. Informational knowledge only goes so far; experience is King." Steve, Please send us another email as our support system has been down. Include your order # and I'll look into it. Thanks. Accurate product, quick communication, good vendor. Order arrived in 14 days, definitely looking forward to further researching this material. Worth the wait and worth the research. Did not work. I usually can research 20-40 mg of 4aco from bcl supply and have a super good time. I started with 40, nothing. Tried 60, nothing. Next day i resesrched a whopping 120 mg, nothing but a headache. Very upset. Recieved within 3 weeks of purchase. Worth the wait.